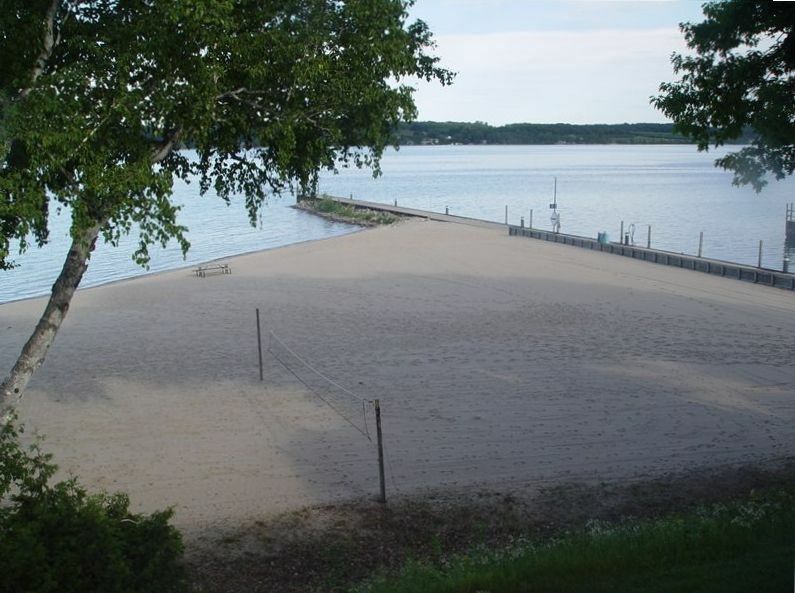 Overlooking more than a 1500 feet of Lake Michigan's finest beach, this condominium provides a total panoramic view with all glass facing Grand Traverse Bay. From its two-story dining room to its individual bedroom balconies and Northwest facing skylights, it captures unforgettable sunrises and creates an atmosphere of complete relaxation. Pets are NOT allowed and No Smoking. The quaint town of Suttons Bay beckons with restaurants that offer great dining that you can walk to. North Country and The Prime Time Saloon offer Seafood delights and the best steaks around. Marthas and the 45th Parallel offer great breakfasts and lunch and the 'VI' club offers lunch and dinner dining at their new outdoor patio. Two ice cream and pizza shops, a first Run Movie Theater, and the best boutique shopping in Northern Michigan, are all ten minutes away by foot. After dinner, a shuttle or ten minute drive affords a visit to the famous Leelanau Sands Casino and Showbar. Top name entertainment and the best gaming in the area provide an atmosphere that you will want to return to. Sightseers will visit the quaint fishing Village of Leland and then travel to the Sleeping Bear Dunes National Park. Those that want only to relax will welcome the huge pool, hot tub, and verandah that is less than 20 yards from the condo door. Golf enthusiasts will savor the three championship courses less than 15 minutes away. Tennis players can sign up to play enjoy the tennis courts. Fisherman and boaters will love the adjoining marina with a deep water boat launch and municipal marina only minutes away. Jet-skis and sailboats can be rented to explore the many Islands in Grand Traverse Bay or access Michigan's finest ports within an easy cruise distance of the Bay. Traverse City, only fifteen miles south, offers all the usual shopping malls, cinemas, and restaurants but also boasts an outlet mall and downtown boutique shopping. It also hosts the Cherry Festival which provides three parades and a week full of fantastic show-stopping festivities and entertainment. Skiers will love the fantastic hills of Sugarloaf, only fifteen minutes away and snowmobilers can take advantage of the extensive trails in around Traverse City. A Four Seasons resort destination, a visit to Suttons Bay is still not complete without a visit to one of the ten wineries on the peninsula which feature great wine tasting and some of the finest wines in the US at bargain prices. If you can't find enough to do in and around Suttons Bay - Just relax on the balcony and pick a book from our library or watch one of the provided video's in Surround Sound. TV's and stereo's in all bedrooms and a full video library stocked for the kids and adults are all provided. Relax and Have fun your way, you deserve it! We have been renting for twenty five years and have enjoyed the experience greatly. We have many returning guests who love the condo, beach, heated pool, 12 person Jacuzzi, tennis courts and marina.